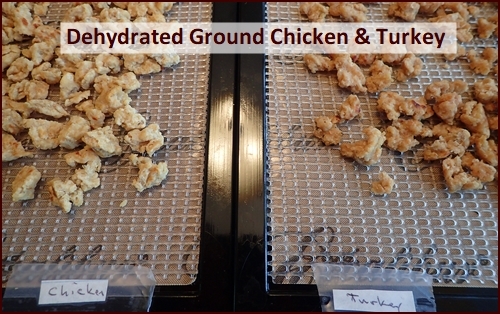 I’m often asked if ground chicken and turkey can be dehydrated the same way as ground beef. Specifically, does the breadcrumb trick work equally well for poultry? The answer is yes; adding breadcrumbs to ground poultry before you cook and dehydrate it results in meat that rehydrates well in meals. The meat retains a pleasant chewiness; you won’t have to suffer through extremely tough meat like you will if the breadcrumbs are left out. Some folks dehydrate ground meat raw. They add seasonings with lots of sodium, squeeze the meat through a jerky gun onto dehydrator trays, and dry it at 160 ° F. While this is a time-honored method, there remains the possibility that pathogens in the meat may survive the dehydration process, especially if the dehydrator doesn’t run as hot as advertised. Precooking meat is the safer strategy. Poultry meat has a looser cellular structure than beef, so there are more spaces for pathogens to hang out in. For that reason, I cook it twice: first on the stove, and then in the oven. As with ground beef, use only low fat ground poultry. I purchased 98% fat free ground breast meat. For each pound of ground poultry, add ½ cup of fine breadcrumbs. Gluten-free bread or cracker crumbs may be used. I seasoned the breadcrumbs lightly with ¼ teaspoon each of salt, pepper, and ground cumin. If you want a bolder sausage-like taste, see this previous newsletter for a faux sausage spice blend. 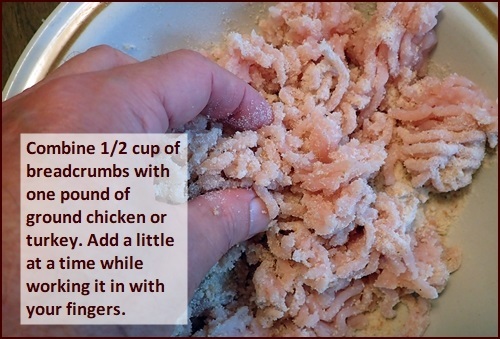 Work the breadcrumbs into the meat a little at a time with your fingers. Form the meat into a ball, set aside for a few minutes, and then pull the meat apart into small pieces. You will find that this can be a sticky affair. Before you cook the meat on the stove, preheat oven to 350° F.
Lightly oil a non-stick pan with one teaspoon of cooking oil. 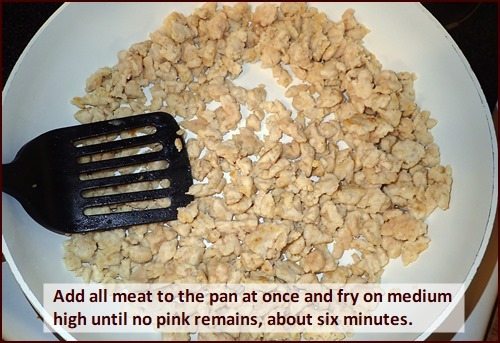 Add all meat at the same time, and fry on medium-high for five to six minutes – until the meat is no longer pink. Stir and flip meat continuously with spatula, chopping any larger pieces in half. Some of the meat will brown lightly, which is a desirable trait. 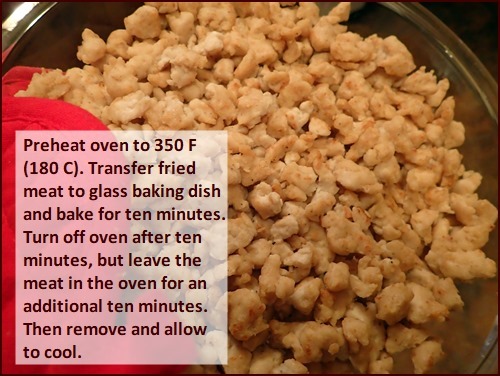 Transfer fried meat to a glass or ceramic baking dish, and place in preheated oven at 350° for ten minutes. After ten minutes, turn off oven, but leave meat in there for another ten minutes. Don’t let any heat out by opening the oven door. After the total of twenty minutes in the oven, remove meat and allow to cool. Once cool enough to handle, spread the cooked meat out on dehydrator trays. Tear any larger pieces into smaller pieces. 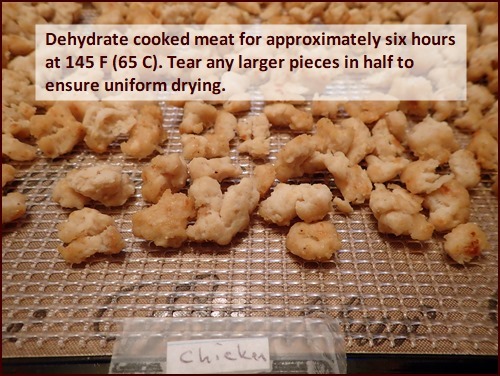 Dehydrate for approximately six hours at 145° F. Since the meat has been thoroughly cooked at a high temperature, there is no need to dehydrate at 160° F. In fact, that can lead to case-hardening, where the outside of the meat dries and hardens while the inside stays moist. 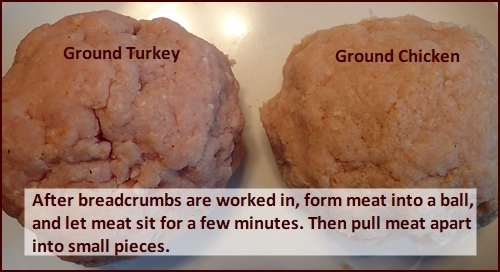 Photo above shows ground chicken and turkey after drying. Tip: If you look closely, you can see that I put the mesh sheets on top of, rather than under, the nonstick sheets. This improves air circulation around the meat, while the nonstick sheets still catch any small bits of dried meat that fall through. 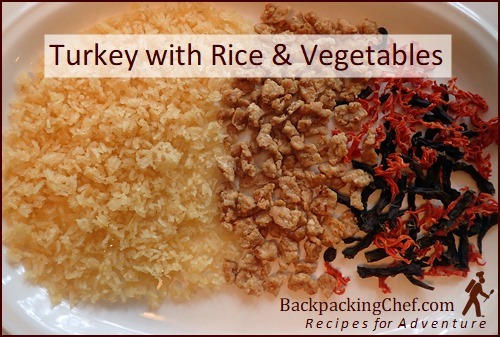 Photo above shows the dried ingredients used to make Turkey with Rice & Vegetables. The cover photo at the top of the newsletter shows what the meal looked like after I rehydrated it. I had ingredients on hand in vacuum sealed jars dated May 2017 – dried rice, carrots, and green beans. The rice had been precooked in fat-free chicken broth before drying. See Dehydrating Rice. Combine dried ingredients with 1½ cups water in pot and soak for five minutes. Light stove, bring to boil, and continue cooking for one minute. Transfer pot to an insulating pot cozy and wait ten minutes. Thermos Cooking: Use 1¾ cups boiled water, a bit more than when cooking this meal in pot. Add boiled water to dried ingredients in thermos food jar in the morning, and enjoy meal for lunch in the afternoon. Delicious. The meat was tender, and I always enjoy a simple meal the lets the flavor of the individual foods stand on their own, rather than be covered up with sauces. Add variety to your backpacking or emergency meal menus by substituting ground chicken or turkey for ground beef in any of my recipes. Before leaving Switzerland for my fall trip back to America, I dehydrated and assembled twenty-four meals for Dominique and Cédric to use for hot thermos lunches while I was away. Having a supply of ready-to-eat meals on hand brings peace of mind knowing we are also prepared in case of emergencies. With all of the natural disasters in the news lately, the photo below, which I posted on the Backpacking Chef Facebook page, received a record number of shares. Whether you have to evacuate or hunker down, you’ll fare better with a supply of dried meals that don’t require refrigeration, are light-weight and compact for transport, and are easy to cook with boiled water. 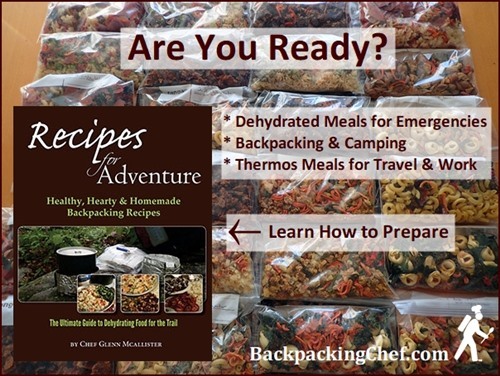 Use the free resources on the website, or buy my book, Recipes for Adventure to cover all your bases – emergency food, hot thermos lunches, and backpacking & camping meals. I love to hear success stories and see photos of packed rations, so feel free to share yours with me. Dominique arrives in Atlanta this afternoon, and that makes Chef Glenn a happy camper. See you next month.